Purple Yoshi GBA game... likely not real! 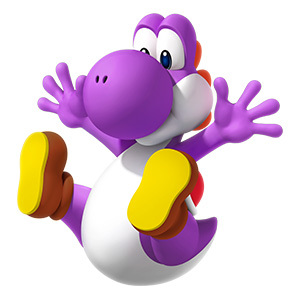 Purple is not one of the most common colours that Yoshi comes in. But nearly two decades ago, in 2000, there was a screenshot of a purple Yoshi in what was supposedly a Game Boy Advance game. This was apparently a "leak" before the GBA itself came out in 2001. 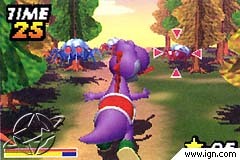 The screenshot resembles Yoshi's Safari for the Super NES with 3D graphics. SM128C has gotten quite a few emails and messages about this mysterious purple Yoshi game that was posted on IGN back in August 2000. In this YouTube video, SM128C is cited as one of the sources of this screenshot, but we merely re-posted the "news" from the IGN Pocket website. LSuperSonicQ - the creator of the YouTube video did some research and found that IGN posted the screenshot on their forum, and only said it was provided by a "Japanese source". There were no further details. That is right! There is finally a high quality Game Boy Advance screenshot...And as you can see it is of Yoshi!! These graphics look astounding. Look at how crisp and clear the image is. Some might say that this rivals the N64. While there is no word on what exactly this game is, it looks a little like "Yoshi's Safari" for the SNES. If this is only a first generation game, just imagine what the GBA can do later in it's life. I am getting more and more excited on what the GBA is capable of, and if things keep going this well, I might have a new favorite system in my hands. One can only hope this is a foreshadow of how good the "Nintendo Dolphin" will be. With a little bit of luck Nintendo could get back its place at #1. Hurry up Nintendo! It looks like you have another winner in your hands! I spoke to SolarGamer about this earlier, and it doesn't seem like there was anything else on this story that he didn't report on. Analyzing the screenshot, the resolution of this image is 240x160 - which is indeed the resolution of the Game Boy Advance, at least this part lines up. Purple would be an odd choice of colour for Yoshi, although he does come in a purple form in Super Mario Sunshine - which was released in 2002. For what it's worth, the purple Yoshi in Super Mario Sunshine actually wears brown shoes, while this Yoshi wears green shoes. His saddle also appears a little long, instead of more of an oval or circular shape. The background enemies don't seem to be anything like what we see in the Mario and Yoshi universes. It just doesn't seem to make sense. The Game Boy Advance came out in early 2001. At launch, the portable system came in three main colours (glacier - transparent blue, arctic - white, and indigo). It can be argued that indigo is a hue of purple. The GameCube home console that came out late 2001 was also launched in indigo. Could this purple Yoshi be a homage to that indigo? Just food for thought. Hardware wise, the GBA is not exactly a powerhouse. At the system launch there was not a single game that showed the 3D capabilities of this screenshot. The GBA's 3D capabilities were primitive at best. There was nothing that compared to what we saw in this Yoshi screenshot. 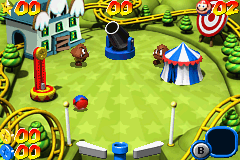 Further into the system's life, there have been a few more games that had 3D pre-rendered graphics, such as Mario Pinball Land - one of the best looking games of the GBA. 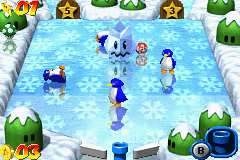 Mario Pinball Land was released in 2004, which was three years after the release of the GBA. 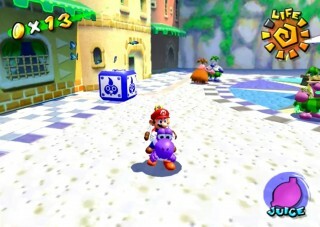 The graphics in this game are still nowhere near the quality of what this Purple Yoshi screenshot portrayed. Even many Nintendo DS games (the GBA's successor) didn't look as good! Beyond this screenshot, there has been no further information ever revealed. Nintendo has never commented on the existence of such a game. Unfortunately, it does seem this is "fake news", and subsequently buried in video game website archives. Do you remember this mysterious purple Yoshi game? Join the conversation in the comments section below!